Previous episodes of Tales from the Borderlands kicked things off with musical numbers full of upbeat shenanigans and masterful sight gags. Episode five’s was so heartbreaking that I nearly cried. Tales from the Borderlands episode five is a finale, and it takes that responsibility very seriously. Don’t get me wrong: there’s still plenty to laugh about, but I’ll be damned if it doesn’t go to some of the Borderlands series darkest places yet. The short version? It’s fantastic, a truly titanic send-off for a cast of characters I never expected to fall in love with, let alone count as some of my favorites in all of gaming. If you’ve been enjoying the series up to this point, the last episode is a no-brainer—to the point that if you walk away now, I will have to assume you have negative three brains. If you haven’t started the series yet, fix that. The season’s complete. The water’s fine. Dive in. Now for some MOSTLY MINOR SPOILERS (turn back if you don’t want to be spoiled, etc). Yeah, this one goes for the throat from the beginning, because it knows the throat is the fastest way to your heartstrings (and it isn’t very good at anatomy). After that moment, though, I couldn’t help but worry: I mean, they killed off The Character I Was Expecting Them To Kill Off; were we headed for a cliche heartbreaker, neck-snapper “epic” conclusion? For a little while, the episode validated my fears. Everything got grim and, worse, predictable. A giant monster took center stage, likable characters valiantly bit the dust battling it, and the game seemed to be haphazardly hurtling toward a wet fart of a conclusion. Ill-conceived, a State-Fair-worthy giant yarn ball of loose ends. Elsewhere Rhys and Handsome Jack had a climactic showdown (Jack: “Oh no, you’re a way better killer than me.” Rhys/Me: “I guess I’ll have to live with that.” CHILLS), but even that wasn’t quite enough to hold up the entire ending. Thankfully, it was all a setup for the episode’s entire second act. Act II represents a huge tonal shift back to the warmth and comradery that makes Tales from the Borderlands so special. Without spoiling too much, I’ll just say that it uses the episode’s earlier darkness as a powerful contrast, and then it chains together a fighting-game-like combo of hits: great gags, character arc resolutions, emotional daggers to the gut, choices that change things pretty significantly, and plot twists (upon plot twists upon plot twists). Also a scene with actual fighting game combos. A few choices you might’ve thought didn’t mean much come into play. Have you been saving up cash? And of course, you finally find out who The Guy In The Mask is. I doubt you’ll see it coming. Oh, and if you have a chance to team up with a certain surprise vault hunter, I recommend going for it. It’s uh... again, I doubt you’ll see it coming. All that said, a few parts of the ending do feel a little rushed, and certain characters don’t get as much of a resolution as I’d have liked. When I finished the episode, it was tough to process it all. So much had happened. In the span of a few hours, I’d experienced so many different, sometimes conflicting feelings. 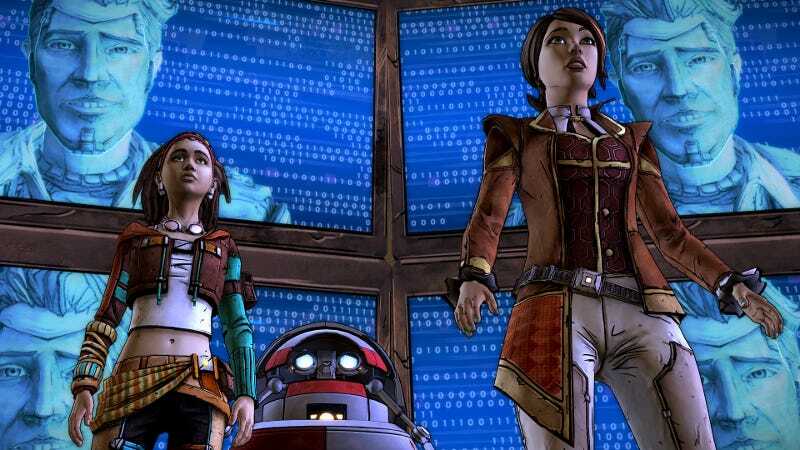 Tales from the Borderlands isn’t, like, the next Citizen Kane or some high art masterpiece, but it’s a ride, a journey, an adventure. It’s one of the best popcorn flicks I’ve ever played—or watched significant chunks of and played intermittently, if I’m being honest about it. It doesn’t revolutionize Telltale’s rapidly aging formula, but it does epitomize it. Over the course of Tales, I made a ton of friends, lost some, and then made even more. These characters felt like people, the sort of people you can’t help but love. I spent a lot of yesterday evening and this morning peeling back my feelings on the episode, whittling away the remaining flecks of its ups and downs, trying to put a sharpened point on this piece. Triumph. That, I found, is the one feeling that stands out the most. This is a series that left me feeling authentically good—about games, about stories, about people. That feeling still hasn’t left. That’s a rare thing to find in any medium. And now, at the end of it all, I can only say this: I miss my friends. I hope I get to see them again soon.